We have such a deal for you! Sailing in a Youth North American Championship doesn’t get any easier. You can sail in the Wave Youth North American Championship in your own back yard – the 2nd event of its kind in history at Sail Sand Point, Seattle, WA on June 26-28th, 2015. You don’t have a boat? So what! That just doesn’t matter because – we’re going to provide the boats for free. The event will have a boat rotation format – just like the World events, so another great learning experience. Short on $100 for the entry fee for 3 days of racing? Don’t let that stop you from having some fun! We have a youth grant program to help with those issues! For every sailor, we have three days of racing, t-shirts, gloves, hats and free raffle – which includes Helly Hansen wet suits, Helly Hanson smock tops, Helly Hansen Duffel Bags, daily breakfast and dinner provided on the Pier of Sail Sand Point along the shores of Lake Washington. The beach will be rockin’ with music and friends. What a great way to start off the summer! We have youth coming from across North America. This will be one of those events – not to be missed! Want to get some training before the big event? Contact Tim Webb – 360-310-0038. If you’re a sponsor and want to get in on the action or for further information about the event, contact Laura Sullivan – 425-432-7749. 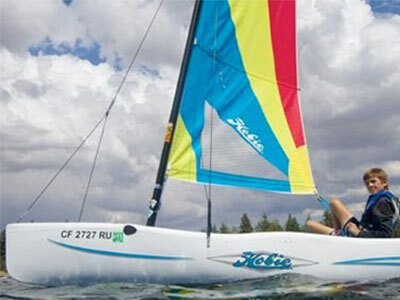 * Must be a member of the Hobie Class Association of North America and be under the age of 21 as of December 31st. 2015. Youth membership is $15.